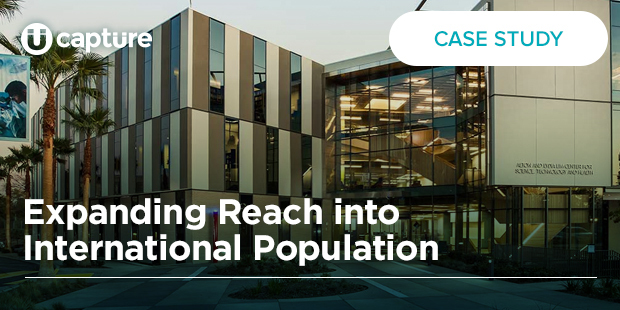 Among Biola’s partnership goals with Capture Higher Ed is to expand the university’s reach and increase its international student population. Biola utilizes CBE and Retargeting together to help drive prospective students back to certain pages where they are then served with dynamic content. It is a great way to keep their brand in front of a prospective student and motivate that student to make a move. Retargeting involves sending customized ads to those who have visited their website in the recent past. These ads remind a prospect to complete an action like filling out an application for admission or signing up for a visit. This multi-channel approach allows Biola to customize ads to students — in this case to appeal to an international audience segment, stimulating brand awareness and engaging the student one-on-one. Solution at Work: In late November 2016, a South Korean student who had visited Biola’s website previously clicked a retargeted ad from the university. The ad took her to the “Financial Aid and Scholarships” page of the school’s website. During that visit back to the website, the student ended up inquiring, creating an account and starting an application. Within two months, the student had completed the application process and was admitted to the school. Out of the 756 international students Capture tracked on Biola’s website, 158 (21 percent) went on to apply; 96 of those students (61 percent) have deposited. Biola University is a nationally ranked Christian university in the heart of Southern California serving more than 6,200 undergraduate, graduate and online students.